Just because you are the host of the most awesome party ever doesn’t mean you know how to whip up everyone’s favorite mixed drink. 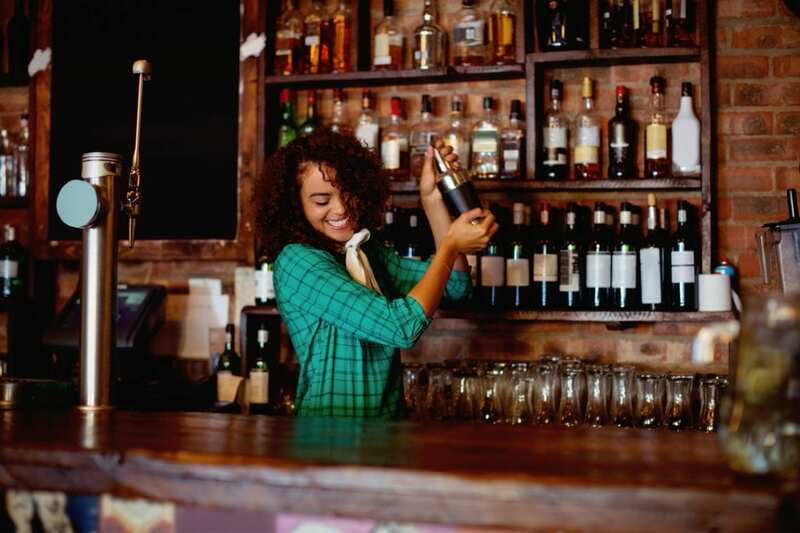 By the time you get behind the bar, all those bottles and tools can look daunting. Fear not! The biggest trick to bartending is acting the part of to suave bartender. After that, it’s all in the little details. Here are some tricks to keep your guests happy and your head on straight. It’s easier than you might think. That seems simple enough, right? Use both hands when you’re trying to complete a task. The thing with bartending is, you can’t ever really rest. While one hand is pouring vodka, the other hand should be using the soda gun to fix the glass with delicious mixers. If your guests require shots (if you’re brave enough to offer them) use one hand to set up the shot glasses while the other is shaking the bottle. Even if you have no idea what you’re doing, keeping busy makes you look qualified and confident. Just make sure keeping busy does not evolve into looking frenzied. That is the number one way to lose all your all your cool bartending points. It’s easy when you’re focused to keep your head down and your eyes locked on your task. When you’re bartending, however, it is important that you keep your head on a swivel. The more aware you are of your surrounding the better you will be able to attend to your guests’ needs. Once one drink is done, keep your eyes up looking for the next order. The faster you are, the happier your guests will be. Unless your guests aren’t heavy drinkers, chances are more than one person is going to want a drink at a time. That means you’re going to have to multitask. While you’re making one drink, don’t just focus on that. Try to make as many as you can at the same time. How is that possible you might ask? Just get the orders from everyone in the group. You might get surprised and everyone wants the same thing. Now you can line up some glasses and pour everyone’s drink at the same time. Now everyone is happy and you just saved yourself some time. Being a bartender is cool. If pouring everyone their favorite drinks isn’t enough for you, however, you can get fancy by learning how to backhand (that’s reverse grip) pour. You’ll look like a real pro if you learn this skill and your guests will be happier because the pour will be more accurate and your wrists will thank you as it is the more comfortable method of pouring. Finally, no one lines a dirty bar. Make your guest feel comfortable by constantly keeping the bar dry, throwing away discarded lemons and keeping all your tools organized. Once your bar looks clean people will be more excited to drink there.